Michael Thompson posted a two over par 74 in his first round at the Zurich Classic in New Orleans on Thursday. He will try to move up the leaderboard on Friday during his second round which begins at 1:30pm local time. He tees off from the tenth hole. You can follow Michael's round on-line with the links below. Michael Thompson was the star player on Tulane’s golf team in 2005, when Hurricane Katrina chased him and his teammates out of town. Tulane eventually dropped its men’s golf team, and Thompson found a second home at Alabama, where he starred for the Crimson Tide before embarking on a professional golf career. That’s one of many reasons why watching the news reports on the killer tornadoes ripping through Tuscaloosa and Birmingham on Wednesday evening wrenched his heart. The Thompsons’ home didn’t have any damage, as the largest tornado went just north of downtown. Thompson, who managed to shoot a 2-over-par 74 Thursday, said the storms reminded him of Katrina, except the devastation happened so much faster. When you see a video of a tornado its hard to take your eyes off of it. Movies have been made about them. People chase them. But when one hits a populated area peoples lives are changed forever. Yesterday, a massive half mile wide tornado raged through the heart of Tuscaloosa, Alabama. Today, as the sun came up, the the scope of the devastation became clear. Many people lost their lives and many others lost their homes or businesses. Please keep the people of Alabama in your thoughts and prayers as they try to rebuild their lives and community. They have a long road ahead of them. Round one of the Zurich Classic in New Orleans, Louisiana gets underway today. Michael Thompson tees off from the first hole with DJ Brigman and Aron Price at 8:40am local time. Michael Thompson is looking for a good week back in one of his favorite cities: New Orleans, Louisiana. 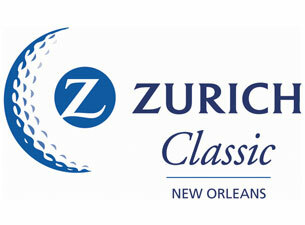 The PGA Tour has moved into The Big Easy this week as the Zurich Classic will be played at the TPC Louisiana. Michael has received some additional attention this week since he's a former Tulane golfer. Bob Fortus of the Times-Picayune interviewed Michael and did a nice little feature on him. You can find the whole article here: Michael Thompson relishing return to New Orleans for Zurich Classic. Thompson said he’s thrilled to be back in New Orleans. "I’m doing better as the year’s gone on. I’m getting comfortable with playing out here." Michael tees off at 8:40am ET with D.J Brigman and Aron Price from the first hole. Michael is all set to play in the Heritage Golf Tournament being held at the Harbour Town golf club in Hilton Head, South Carolina. His first round tee time is at 1:40ET which is the last group of the day. He tees off from the 10th hole. Michael's wife Rachel took part in the PGA Tour Wives Association Classic earlier this week which was held at the Sea Pines Resort Ocean Course. It was her first time playing golf (Thompson Tide note: really?). 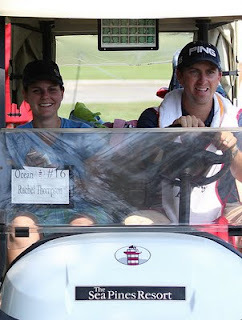 It was a 9 hole scramble with the wives playing and the PGA players working as caddies. Rachel's team won the event, with Rachel making a birdie putt on 17 and a par putt on 18 to secure the win by one stroke. 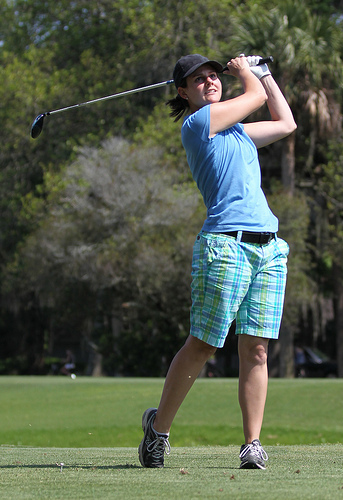 She gave credit to her team saying it was a "Great team effort in the scramble!" "We won the PGA TOUR wives golf classic! My first ever golf tournament and I won!" " I think I found my new favorite sport! Thank you to my wonderful husband for caddying for me!!" This marked the first win for Michael as a caddie. He's now tied with Rachel's caddie win record. She was Michael's caddie at the Michelob Ultra Classic last year on the Hooters Tour which Michael won. The PGA Tour Wives Association Classic is held every two years and rotates around the country. Each Classic is done in order to raise money, half of which is given to a local charity at the location where it's being held, and the other half goes into a fund that the Tour Wives Association distribute nationally. This years local beneficiary was the Hilton Head Heroes, an organization dedicated to bringing families with children between the ages of 4 and 18 suffering from life-threatening illnesses to the island for a no-expenses spared dream vacation. Whatever you do, don't hit it in the "Native Area"
The scores for the tournament were really high due to the wind causing all sorts of chaos. As with many of the players, the second round didn't go so well for Michael. The wind was blowing so hard that it made it tough to keep the ball in the fairway. While I was watching the shot tracker on the first round, it seemed to me like he was playing some pretty consistent golf despite the conditions. During the second round Michael hit his ball into the "Native Area" and ended up getting his first quadruple bogey as a professional. But hey, at least it wasn't a 16. Fellow rookie Brendan Steele won, so let's score one for "The New Breed". While at the Farmers Insurance Open, Michael was in the same grouping as Steele, and his family and friends all seemed really nice. It was nice to see a rookie make the leap to PGA winner. It goes to show that anyone can win "Any Given Sunday". Michael's day will come too. I'm sure Michael would have preferred to have played, but the missed cut meant he could have his birthday (April 16) off. The new shuffle list came out today, and Michael didn't lose any additional positions. What's next: Onward and Upward. After starting out as first alternate, Michael is now in the field for The Heritage which is being held at Harbour Town Golf Links in Hilton Head, South Carolina. 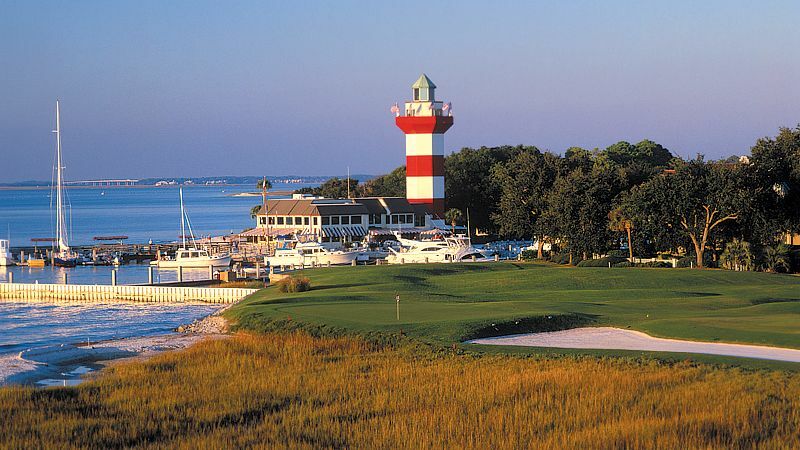 If you're an old-school PC gamer like myself you may remember Harbour Town from the classic PC golf game Links LS. My limited knowledge of golf comes primarily from playing that game for hours on end. Oh how I miss that game. 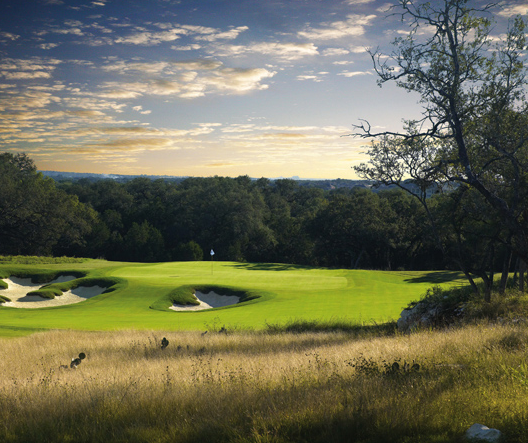 Michael is set to play Thursday at the Valero Texas Open which is being held on the AT&T Oaks Course at TPC San Antonio. He has a 9:00 am tee time and will be grouped with fellow PGA rookies Kevin Chappell and Joseph Bramlett. Many of the big name players are taking the week off which will leave the $6.2 million purse to be split amongst the lessor know players. Michael will be joined not only by his wife Rachel, but his parents Mike and Beth, along with a family that hosted him in Austin, TX while he was playing on the Hooters Tour. Michael's aunt Pat was at the tournament in Austin and said that this particular family was incredibly gracious and had Michael's parents and extended family over for a barbecue. He played well that week in Austin so let's hope some of that Texas mojo returns this year as well. Michael Thompson's stats as of 4/10/11. Click on the image to get a better view. 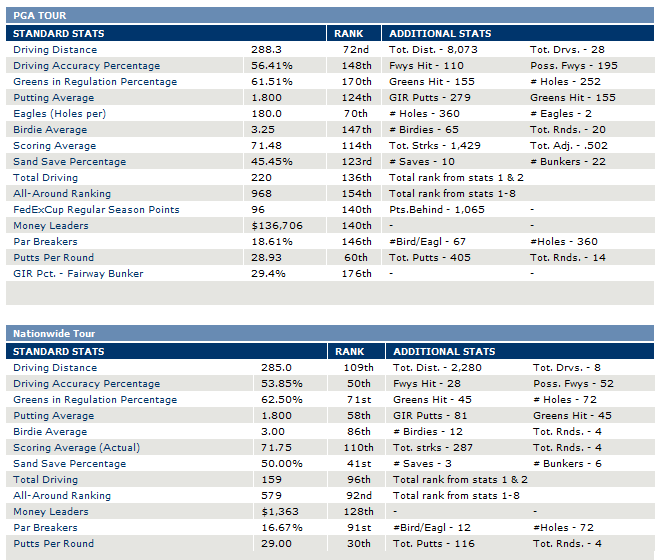 Are you confused by all of the stats thrown around in golf? Don't feel bad, next to baseball, golf keeps more statistics than pretty much any other sport out there. We're guilty of using them all of the time here at ThompsonTide because often they are the easiest way to evaluate a round (other than the overall score). So we thought we'd throw a little "cheat sheet" together for the stats you'll most often see here at ThompsonTide.com or over at PGATour.com. PGA Definition: The percentage of time a tee shot comes to rest in the fairway (regardless of club). Why It Matters: This stat is intended to provide a measurement of how accurate a golfer is with their tee shot. Obviously, when a drive is in the fairway the subsequent shot should be easier. A tee shot that lands in the first cut of rough counts the same as a shot that goes out of bounds - that is it counts as a missed fairway. Nuances: Although this stat is intended to measure tee shot accuracy, it is only applied to par four and par five holes. It also doesn't matter what club is used so an iron off the tee counts the same as a driver off the tee. PGA Definition: The average number of yards per measured drive. These drives are measured on two holes per round. Care is taken to select two holes which face in opposite directions to counteract the effect of wind. Drives are measured to the point at which they come to rest regardless of whether they are in the fairway or not. Why It Matters: The further the drive off the tee, the easier the subsequent shot(s) to the hole. Typically, the shorter the approach shot to the green, the closer to the hole you'll be. Nuances: Since the driving distance is measured to the final resting place of the ball, this stat can be significantly affected by the driving accuracy stat. Obviously, a ball landing in the rough or a bunker will not roll as far as one in the fairway. If a player's driving distance is down for a particular round or tournament, it may be due to some missed fairways. Why It Matters: If you hit a green in regulation, by definition, you have a putt for either birdie or eagle. The GIR stat doesn't take into account distance from the hole. Nuances: The fringe around the green is not considered part of the green. If the ball lands in the fringe it is considered a missed GIR even if the subsequent shot is made with a putter. 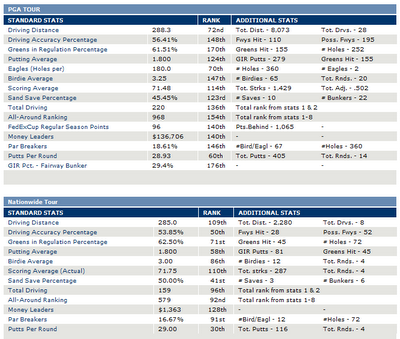 PGA Definition: The average number of putts per round played. Why It Matters: More than 40% of a player's shots in a round will be putts. The fewer of them you have, the better score you'll have for the round. Nuances: A putt is only considered a putt if it originates on the green. If a player putts from just off the green it is not considered within the putting stats. If a putt is holed from off the green it is counted the same as a chip in and would result in 0 putts for the hole even though the putter was used to make the shot. PGA Definition: The average number of putts per hole that was reached in regulation. Why It Matters: Rather than measuring the overall putts in a round, this stat measures the number of putts on each hole reached in regulation. The lower this number, the more birdies and eagles are converted per GIR which results in a lower overall score. This stat provides a qualitative way of measuring both putting proficiency and the quality of approach within the GIR stat. PGA Definition: The percent of time 3 or more putts were taken for a hole (total 3-putts, 4-putts, etc./ total holes played). Why It Matters: Typically, a 3-putt will result in a bogey or worse. Avoiding 3-putts will typically result in scoring par or better on a hole. This stat also provides an indication how well a player is putting overall since avoiding 3-putts requires leaving longer putts in a makeable position. You want this stat to be a low number. 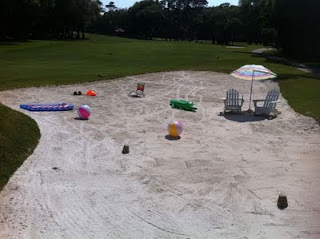 Sand Save PercentagePGA Definition: The percent of time a player was able to get 'up and down' once in a greenside sand bunker (regardless of score). Note: 'Up and down' indicates it took the player 2 shots or less to put the ball in the hole from that point. Why It Matters: Usually landing in a greenside bunker is the result of missing a green in regulation. Since the GIR stat assumes you have two putts to make par or better, getting "up and down" from a greenside bunker means that you've scored the same as a 2-putt. Nuances: Landing in a fairway bunker doesn't affect this stat. It is measuring "up and down" from greenside bunkers only. Often times you'll see a player have a sand save percentage of "-". This simply means that the player's round (or tournament) didn't include any shots from a greenside bunker. PGA Definition: The percent of time a player misses the green in regulation, but still makes par or better. Why It Matters: In the same way that the putts per GIR stat measures the quality of play when a green is hit in regulation, the scrambling percentage provides a stat to indicate how well a player is scoring when the green is missed in regulation. This stat is often referred to when describing how good a golfer's "short game" is because it usually involves chipping from off the green or making sand saves. Nuances: This stat takes into account the sand save percentage as well as any "up and downs" from the green side fringe or rough. PGA Definition: The average distance the ball comes to rest from the hole (in feet) after the player's approach shot. 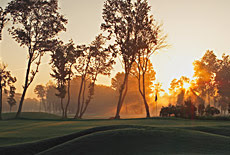 The approach shot distance must be determined by a laser, and the shot must not originate from on or around the green. The shot also must end on or around the green or in the hole. Note: 'Around the green' indicates the ball is within 30 yards of the edge of the green. Why It Matters: This stat typically measures how well a golfer's iron play is. The closer to the hole an approach shot is, the better the scoring opportunity. Nuances: This stat is valid no matter what score is made on a hole and is valid no matter where the approach shot lands (as long as it is within 90 feet of the hole). This stat is typically not kept during tournaments where the Shot Tracker system isn't in use because of the PGA's requirement that the measurement be taken with a laser. New Thompson Tide Gear is Here! The new Thompson Tide shirts are here! Are you going to see Michael play in an upcoming tournament and want people to know who you're rooting for? Do you want to show your support for Michael Thompson while you're out and about? Are you in need of some new duds? We have the solution for you! 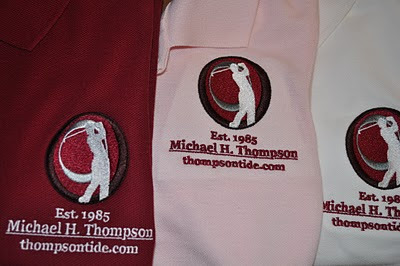 The new ThompsonTide/Michael Thompson golf shirts are now available. They come in crimson, white, and pink and feature the official Thompson Tide logo. Does the golfer in the logo look familiar? He should, it's Michael in full swing. Back when we were planning to attend the Farmers Insurance Open, we decided to make some thompsontide.com polo shirts to show our support for Michael. We've had lots of positive responses from family and friends who in turn were asking for shirts of their own. Thus, we decided to make them available to anyone who wants one. The cost is $56 per shirt which includes shipping and handling within the US. The shirts are made to order so they'll take approximately 2-3 weeks to show up on your door step. So how do you get one? Send me an e-mail at roz@thompsontide.com and we'll work out the details. Thompson Has "Best Tournament So Far This Year"
After having what he called the "best tournament so far this year", Michael Thompson has finished in the top 25 in back to back PGA tournaments. Michael shot 2 under par in his final round to finish the Shell Houston Open at seven under par which was good enough to tie for 24th. In his last eight rounds on the PGA Tour, Michael is a very impressive sixteen under par! The greens at the Redstone Golf Club Tournament Course must have agreed with him because he was 2nd in putts per greens in regulation (GIR) and tied for 2nd in putts per round. He continued his strong putting in the final round which included a 38 foot birdie on the fourteenth hole. At one point during the final round (roughly 3pm ET), Michael actually climbed into a tie for 12th at 9 under par before a couple of bogeys during the very difficult closing stretch dropped him a few spots. The leader board was fairly tightly bunched for much of the final two rounds. Not only will Michael bring home a nice paycheck for the week, but he also will have moved up 13 spots when the reshuffle occurs tomorrow. His higher ranking on the list will improve his chances to get into upcoming PGA Tour events. Michael will take a well deserved week off while the Masters is being played and then hopefully get into the field at the Valero Texas Open in San Antonio, Texas the following week. He's played in that tournament before, finishing T28 in 2008. Thanks to Rob Hurst for his tweets from the course during the final two rounds. You can follow him on Twitter (@RobTheCop1898). Update: As expected, Michael jumped up to #24 on the reshuffle list. He also moved up in the Rookie Rankings to #12. Michael Thompson continued his solid play at the Shell Houston Open with a 2 under par 70 during his third round. He sits in a tie for 34th at 5 under par for the tournament after a round that included four birdies, two bogeys, and twelve pars. Calmer winds provided better scoring conditions on Saturday but the wind is expected to pick up for the final round on Sunday. The tournament's final round will return to the typical PGA Tour weekend format where all players will be grouped in pairs and start from tee 1. Michael will tee of at 9:57am local time with John Sendon. Television coverage for tomorrow's final round will be carried on the Golf Channel and NBC. 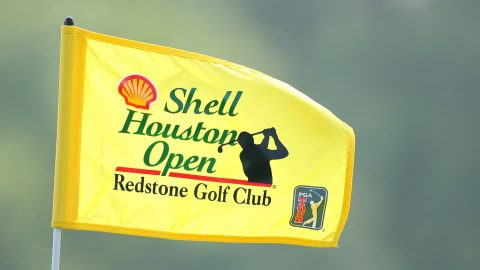 Michael Thompson compiled 7 birdies on the way to shooting 3 under par at the Shell Houston Open on Friday. The round was good enough to move up 39 spots on the leaderboard into a tie for 30th and to make it inside the cut by three strokes. The Redstone Golf Club Tournament Course has been set up to emulate the conditions at Augusta National, home of the Masters, in order to attract a bigger field the week before the Masters takes place. The results are very fast greens and lots of trouble if you're not in the fairway. Michael's round got off to a rocky start when he double bogeyed hist first hole of the day (hole #10). He didn't let the hole affect him, however and he birdied two of the next three holes to climb back to par. He grabbed two more birdies during his front nine including an improbable birdie at the very difficult par 4 18th hole. Michael finished his eleventh hole at two under par but found the water with his drive on the par 4 3rd hole. He went on to double bogey hole #3 which left him at even par for both the round and the tournament. At the time the tournament cut was projected to be right around even par. Once again, Michael didn't let the double bogey affect him and he proceeded to birdie the next three holes moving him well inside the cut and positioning him well for "moving day". Eighty players made the cut, which fell at even par, so tee times will be split tomorrow between the first and the tenth tees. Michael is paired with Hunter Mahan and Jim Herman. Michael and Mahan have a common bond since they both use the same agent - Jay Danzi. The group tees off from hole #1 at 8:40am local time. Michael Thompson dropped a 47-footer from just off the front side of the green on Kodak Challenge hole No. 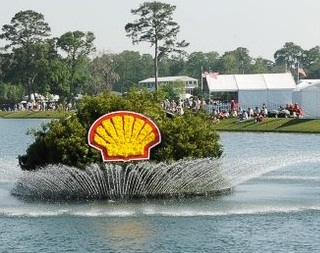 18 at Redstone Golf Club, delivering the second round's Shot of the Day during the Shell Houston Open. Thompson was one of only 11 Kodak Challengers to birdie the 488-yard par-4 hole on Friday, while 40 pros played the feisty finishing hole over par. Television coverage for tomorrow's round will be carried on the Golf Channel and NBC.